Riggins Oil, family owned and operated through four generations beginning in 1926, is a Southern New Jersey business providing a wide range of energy solutions to consumer, commercial, and government customers. 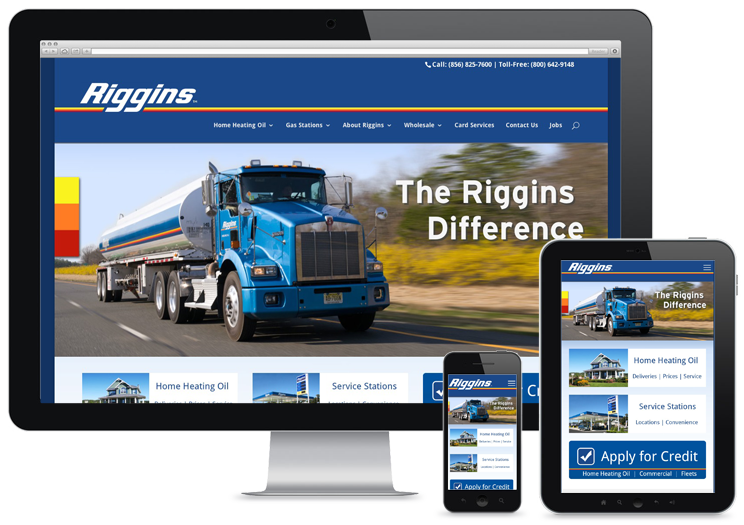 Riggins offers wholesale and retail delivery of gasoline, diesel, biodiesel, heating oil, and more to customers in New Jersey, Pennsylvania, and Delaware, and operates more than 30 Riggins-branded gasoline service stations throughout the region. Hypno performed an extensive information architecture phase for Riggins to help isolate and organize content directed to their 5 different market segments. Working with the brand manager for Riggins, Hypno also developed a much needed branding review and branding guildelines for Riggins’ diverse businesses. When the branding was done, and a clear path for design and development was ready, Hypno designed and programmed their new website, so they could easily maintain it in-house, and it has continued to draw many leads and new business for Riggins ever since it launched. Along with this website Hypno created a new brand logo for a new Riggins retail entity R-Cafe, that they cobrand with their service stations in a pilot program.